On Saturday, a newly discovered 50-150-foot-long asteroid was spotted. Later that night, it flew by Earth at less than one-quarter of the distance to the moon. Don’t panic, though. It’s fine. We’re fine. Everything’s fine. What has people unsettled isn’t only how close the asteroid came to earth, but rather, how something that large stayed hidden for so long when its path came so near to our home planet. The answer, in part, is simply that space is very big and full of lots of stuff flying around. It’s very easy to miss something of importance. 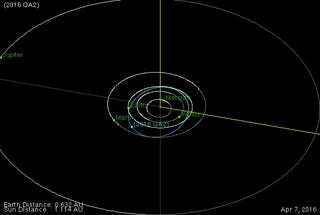 But in this case, the reason we didn’t see the asteroid is that it travels in an odd orbit. If you look at the path of 2016 QA2 below, you can definitely see it come close to Earth for its weekend fly-by—but more broadly, its elliptical orbit means that it spent a lot of time out in the further planetary regions by Mercury, Venus, and Mars. 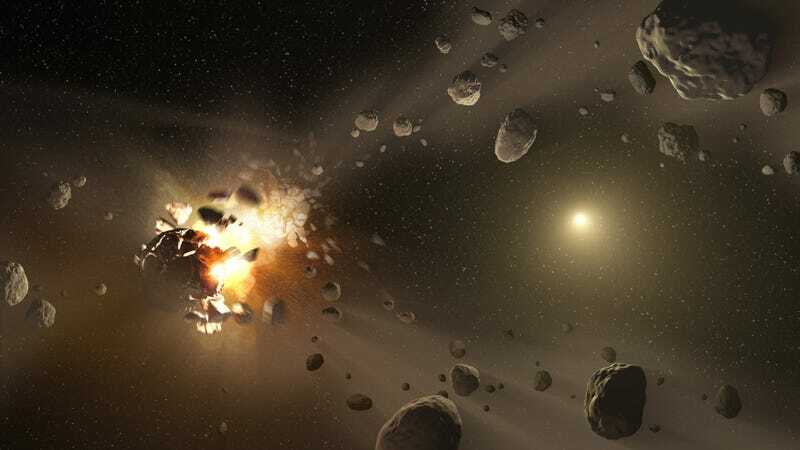 If its close brush with Earth still leaves you a little uneasy, however, remember that just because an asteroid flew near Earth doesn’t mean it came near to actually hitting Earth. Though we managed to get a pretty close look at the asteroid this time, 2016 QA2's orbit isn’t anything for us to worry about in the long run.